The EZP series has been discontinued. Please see the G303 Series as a possible alternative or contact our Automation Engineering department. EZDaq (EZ’s Data Acquisition Utility Option) uses the RS232 programming port to a PC or Ethernet for communicating with multiple panels allowing data acquisition in a PC remote from the panel. The user specifies tags and schedules for data acquisition. Data files are organized in a convenient, user selectable format (tab delimited or CSV) and can be opened in Excel or in any text editor. EZDaq Software installed on your PC can select any tag you want to monitor on the PLC / Panel, watch the data coming in real time (as compared to receiving only a snap-shot when certain event occurs) and plot it into an Excel sheet automatically. Time intervals on event triggers can be selected from a wide range of options. NO Compilation or Download... NO Machine Down Time... Just Click and Save to Panel. Develop and finalize one screen in 10 minutes. 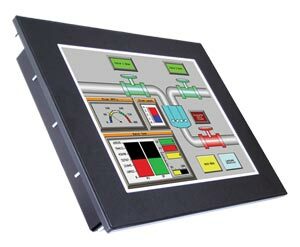 Because of the use of vector based graphics and a proprietary OS, EZ Series Touchpanels are universally recognized as having the fastest response to touch inputs, typically less than 3/4 of a second even with complex screens. This means no waiting and also less wear on a panel from operators pounding an object on a screen waiting for a response. NOTE: Programming software (EZP-PANELEDIT) and programming cable (EZP-PGMCBL) required.